REDWOOD CITY, Calif.--(BUSINESS WIRE)--YuMe, Inc. (NYSE: YUME), a proven partner for video advertising leadership and innovation, in partnership with Isobar, a global digital agency; RLTY CHK, an immersive entertainment studio; and RetinadVR, the leading immersive media analytics platform, today released the results of a new virtual reality (VR) in-game advertising study. 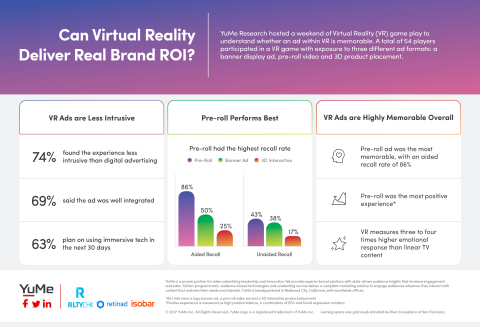 The study compared consumer responses to three forms of VR advertising — a pre-roll video ad, brand logos present in-game and 3D branded objects inserted into interactive game play. The findings revealed that, overall, VR advertising is highly memorable with 70% aided recall across all ad formats. The highest levels of brand recall occurred with the pre-roll video ad, which achieved 90% aided recall on the day the study was conducted. This press release contains forward-looking statements, including those in management quotations. In some cases, you can identify forward-looking statements by the words "may," "will," "expect," "intend," "plan," "objective," "anticipate," "believe," "estimate," "predict," "project," "potential," "continue" and "ongoing," or the negative of these terms, or other comparable terminology intended to identify statements about the future. All statements other than statements of historical fact are statements that could be forward-looking statements, including, but not limited to, statements about the impact and value of advertising in the context of virtual reality (including the different formats thereof), and the benefits derived therefrom; market trends; and quotations from management. These forward-looking statements are subject to risks and uncertainties, assumptions and other factors that could cause actual results and the timing of events to differ materially from future results that are expressed or implied in the forward-looking statements. These risks are discussed under "Risk Factors" in YuMe’s Quarterly Report on Form 10-Q for the quarter ended June 30, 2017 that has been filed with the U.S. Securities and Exchange Commission (the “SEC”), and in our future filings and reports with the SEC. The forward-looking statements in this press release are based on information available to YuMe as of the date hereof, and we assume no obligation to update any forward-looking statements.